Thondimuthalam Driksakshiyum is having a dream run at the Kerala box office for its simple storytelling and for the “Pothettan Brilliance”. The movie directed by Dileesh Pothen stars Fahadh Faasil, Suraj Venjaramood and Nimisha Sajayan in the lead. What new we hear is that,yesteryear actress Lissy Lakshmi had hosted a special screening of the movie at Le Magic Lantern and the show was attended by the great Maniratnam, Vijay Sethupathy, Vijay Antony, Jayam Mohanraja etc and it seems all of them loved the style of making and Maniratnam gave a thumbs up for the movie. Thondimuthalam Driksakshiyum is also said to have collected over 8 crores from the box office from its week-long run. 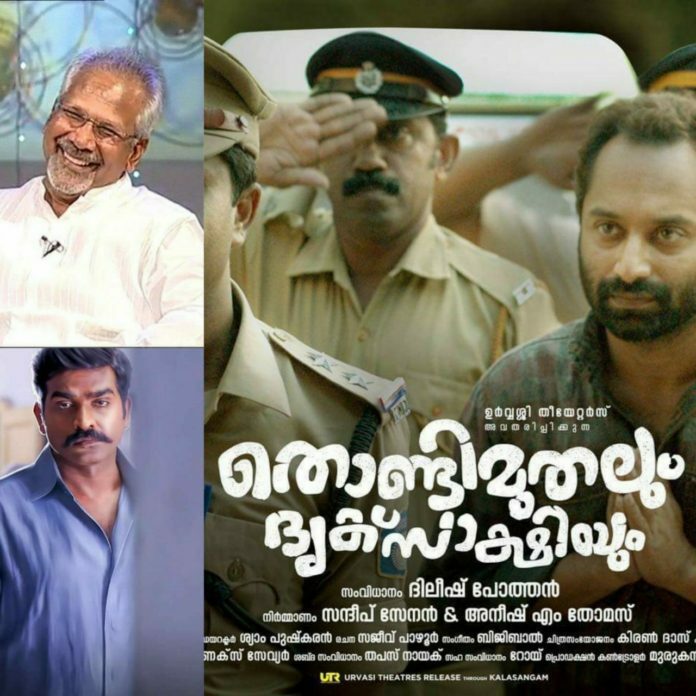 This is Dileesh Pothen’s second straight directorial after 2016 Superhit Maheshinte Pratheekaram. His brilliance in direction earned him a lot of appreciation from social media and lead to the coining of the word “Pothettan Brilliance”.